I have not even made it down there yet. But Capt Bob has gone out of his way to ensure that my trip in May will be a success. Capt Bob has shown more respect for the customer than all of the other boat rental companies. He is sincere and takes his time in explaining everything that you need to know. Thanks Bob!! We just finished up our annual keys vacation and as always we rented a boat from Capt Bob. This year we rented the 27 Sea Chaser. What an amazing boat, twin 200 E-tecs, dual livewells, Taco outriggers, and a color plotter. If you fish far this is the boat for you, extreme power and very responsive wrapped in a fuel efficient package. Again Capt Bob was great to deal with. I strongly recommend Capt Bob and his boats. Thanks again Bob, see you in Dec.
Hi Capt. Bob Just wanted to thank you for the excellent boat and service supplied for the rental, look foreward to seeing you again next year. I just completed an 11 day rental from your company. Thank you so much for providing such a nice rental experience. The boat was excellent and the price was just right. Thank you so much. You are blessed to have a great dock crew who delivered the boat to us. From the way they went over everything on the boat with us to their kind manner they were great. Kim was also wonderful. She is just such a pleasant person to speak with on the phone and attentive to every detail. I will recommend your company and look forward to renting from you again. You are blessed to have a great crew who delivered the boat to us. Your dock crew was wonderful. Captain Bob, We had our annual fishing trip in July and rented your 27' Sea Chaser. We had a great time and caught some nice fish. I really appreciate the reliable service and the great boat you provided. You guys do the Boat Rental business right. We look forward to seeing you guys next summer. Now that I am almost fully recovered from the trip, I wanted to let you know how much we enjoyed it. The Cape Horn ran well in some rough seas, and we sure appreciated the fine service and prompt attention given to us by all of your dock hand crew. Thanks again, and we'll see you next year! ps those Suzuki's were very enonomical on fuel. Capt. Bob. We had a ball last week. Your are the best boat rental company on the Keys. We are bragging to everyone how you drove 40 miles one morning at 6 and replaced the live well pump. Then when a motor blew a belt,you were there with another boat when we got in. Boats were set up great for fishing. We'll always come to you for fishing boats. Message It was our first time to the Florida Keys. (what a great place!) I chose to rent a 22' Sea Chaser with 150hp outboard from Captain Bob. It was really a great boat; heavy enough to beat through the waves in comfort. We stayed in Islamorada, and Vacation Boat Rentals trailered the boat to us for $100 (which, now that I know how far it is, is REALLY reasonable) We rented fishing rods for the whole family for a very reasonable price. We had a GREAT vacation and I'd highly recommend renting from Vacation Boat Rentals! Thanks, Guys!!! We recently rented a 22' Sea Chaser with several rods/reels. The guys who delivered the boat to us in Key Largo, went over all the details, and set us free. We had a great time. Temps at home were in the teens, while in the tropical keys...70s-80s in January! The boat, engine and equipment were in very good condition. I would recommend your company to friends, and did recommend you by name in the review of the house we rented. Thank you for a seamless transition into vacation zone. Dear Capt. Bob, Just wanted to drop you a line to thank you for coming to our rescue after being let down by a 'popular' rental company in Islamorada. We have been renting boats in the Keys for 10 years and without doubt your boats, prices and customer service are the absolute best!! I just wish we found you years ago! Never had a boat with a fresh water shower before....that was fantastic after snorkelling & diving. The company we rent our apartment from were also very impressed by your service and will be including a link to your website on their internet site. Once again, I can't thank you and your staff enough and we will be in touch soon for our next visit. Superb Service! Captain Bob and staff, I would like to thank you for the great service. I just completed my second rental with you guys and I wasn't disappointed. Even though the weather was terrible,I wasn't disapointed with your service. Your "guys at the dock" are amazing. One of your men was sorting things out at the fuel dock (major hassle) and then running down and docking boats at the other end. The drop off guy went over the whole boat with us and didn't leave until we were completely satified. He even went over the outrigger use. They both thanked us for our business numerous times. As a "field services" business owner with 20 guys on the street, I know what I want to see from my people and your guys have it. I don't remember their names but I'm sure you know who they are. We'll be back soon and will rent again from Vacation Boat Rentals. Keep those young men happy, they reflect very well on your company. Randi Barra ACE Environmental PS: 5 mph winds and $1.00 / Gallon fuel would be nice. Can you get working on that too! Thanks again. Very Good Buisness! I rented a boat for the week from Capt. Bob and had a great time. The boat was delivered on time and was nice and clean and had all the equipment you need for a week of fishing and diving. I gurantee I will be renting from you again. Thanks for the great time and I'm already missing the Keys. I highly recommend Capt. Bob Boat Rentals! I just wanted to thank you and your staff for our boat rental a week ago. We rented one of your 22' Sea Chasers and this boat was perfect for fishing both inside and outside the reef! I have rented boats at various outfitters in the Keys over the past ten years and your boats are by far the nicest I have rented! The boat was equipped with everything (gps, outriggers, livewell....) needed for fishing in the Keys and we had an absolute blast fishing for five days. We are already planning next years trip and look forward to renting one of your boats again! Thanks Again. Message Great boat at a reasonable price. We had a two day rental from Captain Bob. We were staying up the canal from his rental place and he let us take the boat up to our slip so we could just go fishing in the morning with out spending the time with the paper work. The guys on the dock had all the hot spots set up on the GPS and all we had to do was follow the map. The fishing was so good we had to leave the lines out of the water just to eat a sandwich and the boat performed flawlessly. Returning the boat also was easy, we just filled the gas tank and dropped it off the last evening. We will be using Captain Bob's boats again next year. You and your crew are great! We wanted to say a quick thank you for such a wonderful weekend. We enjoyed two days of fishing and great weather as well as a glorious moonlit night aboard the Glacier Bay. We will definitely come back! Captain Bob, Just wanted to thank you and your dock crew once again for a great experience. Your customer service is unequalled. We look forward to next year and our third straight year of renting from Vacation Boat Rentals. We just finished renting a 25' Dusky from you guys (2nd year in a row). I wanted to thank you for another great rental experience. The boat was clean and handled well. Although we did not use your dock, the guys were very responsive to calls I made with questions and they even made a house call to fix the live well. Thanks again and I look forward to renting from you soon. One of the smoothest operations I have ever dealt with in the keys for over 40 years.Very easy going staff and owner that you can tell really appreciate your business and got us out of there in about 30 mins.There are many flakes and jerks working most of these rental places but Capt Bob is down to earth and treated us the way we wanted to be treated. Already planning our next trip. It was my girlfriend's first time and she can't wait to go back. Capt Bob.. We really did enjoy meeting you and the staff at Vacation Boat Rentals this past week. I know the rental business is very difficult at times but you and your staff took excellent care of us and we really had a great time. We will be back in a few months to do it all over again. Meanwhile here are a couple of the photos of the nice Dolphin we caught while using your boat and gear. I finally have a few minutes to let you know how much I appreciate you, the dock crew guys, and young ladies at the reservation desk who made our Keys fishing trip one of the best. The 22 foot Seachaser we rented was in top condition and the driest boat I've ever been on. (I used to own a 25 foot Mako, soaking wet at the end of an average day and your knees felt like you jumped out of a 2nd story window, I'll say no more). Having the boat delivered to our dock and pick it up maximized our time in paradise. Also, thanks for the fish cooler. We filled it twice and always brought home fish. I'll be contacting you early next year as we finalize our plans to visit the Keys. SIMPLY THE BEST, we rented from Capt Bob for the second year running and this year he delivered all the way to Key Largo for us. 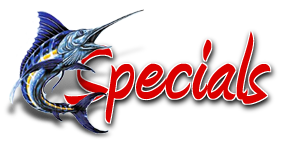 The boats are fantastic and his service and prices are the best in the Florida Keys. A big thankyou to Capt Bob and your crew. See you again in October.